Ya Jagoff!!! 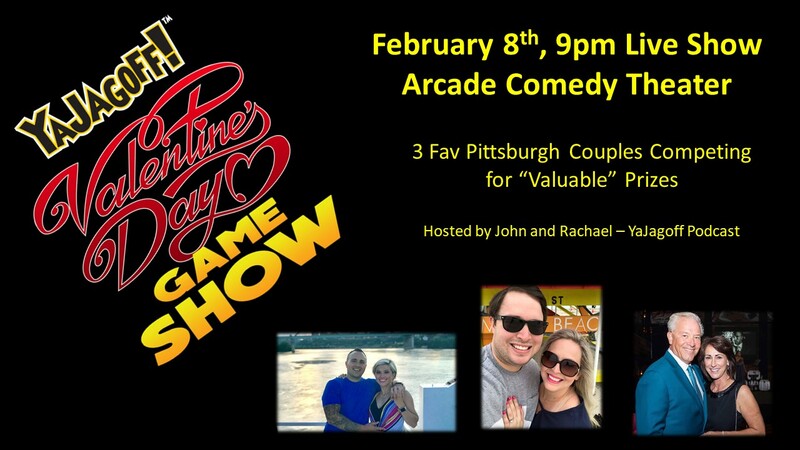 | The YaJagoff "Couple" of Laughs Valentine Game Show! - You Need to Come! The YaJagoff “Couple” of Laughs Valentine Game Show! – You Need to Come! How best to celebrate Valentine’s Day? Well, gather 3 of Pittsburgh’s most-loved, and CUTEST of course, couples. Convince them to come to Arcade Comedy Theater for a night out.. and BOOM! You have a live game show that is called the YaJagoff “Couple” of Laughs Valentine Game Show! John and Rachael of the YaJagoff Podcast will be hosting the show at the Arcade Comedy Theater and recording the show as a podcast episode. One of the favorite musicians of the YaJagoff Podcast, Byron Nash, will be on hand to get the show started and entertain everyone when John and Rachael become boring! Next articleJust Here To Help? Well Now!